Final two teams not decided until the very end of Saturday’s games. 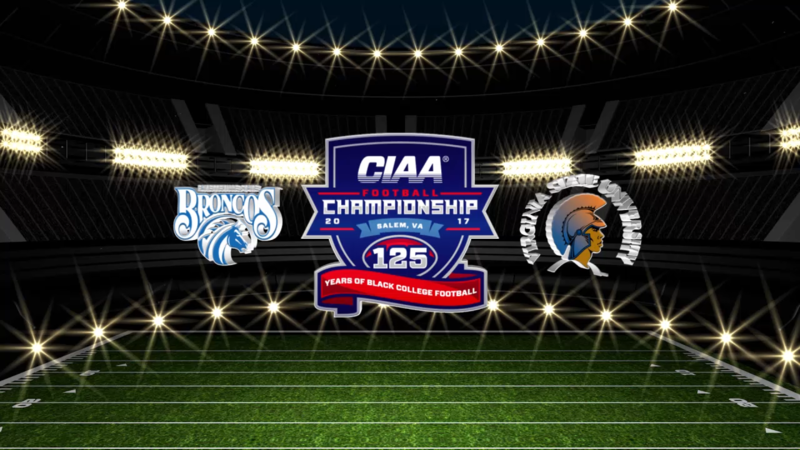 How do you even sum up how the CIAA Championship slate was set on Saturday afternoon? Nerve wrecking? Gut-wrenching? That sounds about right. We’ll begin in Winston-Salem where Fayetteville State was out of it, back in it, out of it and finally won against Winston-Salem State University. The Broncos scored the go-ahead touchdown and extra point when Darnell Walker rushed in from the one-yard out with 30 seconds remaining to tie the game at 22. The Rams tried to freeze kicker David Lamb with a timeout, but he nailed the extra point to put the Broncos up 23-22. WSSU had one foot on the banana peel when they got the ball back with 24 seconds left but Rod Tinsley found Quincy Jackson with a 47-yard strike all the way down to the Broncos one-yard line. Jackson’s momentum carried him into the end zone after being ruled down and apparently, his WSSU teammates must have thought he scored because they rushed into the end zone celebrating. That drew an unsportsmanlike conduct penalty, backing the ball up 15 yards. With four seconds left Daniel Rivera missed on a 36-yarder and Fayetteville State celebrated its first win over WSSU since 2004. More importantly, its ticket to the CIAA Championship was officially punched. On to Virginia where late in the game it appeared as if Bowie State would benefit from a Virginia Union upset of Virginia State. Had the Trojans lost by 18 points or fewer to the Panthers, then Bowie State would have made it back to Salem via a tiebreaker. How Virginia State got into the hole was the interesting part, seeing that it started the game up 14-0 and led 28-17 at halftime. In the third quarter, VUU exploded with three unanswered touchdowns to take a 39-28 lead into the fourth quarter on the road. Niko Johnson found Joshua Harris on a four-yard pass for VSU to cut the lead down to 39-34 at the start of the fourth but Cannon’s two-point conversion attempt failed. The rest of the quarter was a virtual stalemate between the two teams until Diontae Bruce picked off VUU QB Darius Taylor at the Panther 24-yard line returning it ten yards. Trent Cannon rushed for the go-ahead touchdown with 1:30 remaining, putting VSU back on top 40-39. A two-point conversion attempt failed. On the final drive, Taylor was intercepted once again and the Trojans were able to run the clock out and switch its attention to the championship. Not only did the fans of the two schools have to sweat out victories today, their cross-conference “frenemies” saw their own destinies dangling before them. Had WSSU converted that final field goal it would have put Saint Augustine’s into the championship after the Falcons defeated Shaw University earlier in the day. Meanwhile, Bowie State had manhandled Elizabeth City State 77-21 and would have returned to the championship for a third straight year if VUU would have held on to its fourth-quarter lead. Now the regular season is complete here is what we do know. No matter what happens in Salem, both BSU and VSU should make it into the NCAA Division II playoffs. The season is over for WSSU and its CIAA Southern Division dominance could be over as well. At the very least this season was a huge blip on the radar with losses to both Saint Augustine’s and Fayetteville State on its resume this season. Virginia State with its unbeaten record is a clear favorite over Fayetteville State. The two teams didn’t face one another this season but the Broncos did lose to Elizabeth City State, Virginia Union, and Bowie State during a three week stretch in September, teams that VSU defeated. It’s now November and anything is possible. The CIAA Championship is set for a 4:30 p.m. start on Saturday in Salem, Virginia.